Plum Brook's lily pad area over the pressure vessel shown with the shrapnel shields removed. 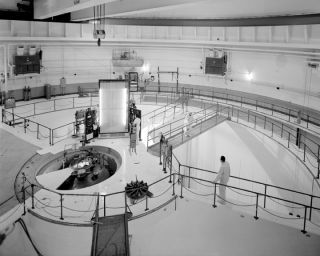 In this historical photo from the U.S. space agency, the lily pad area atop the reactor pressure tank shown in 1961. For over ten years, engineers subjected materials to radiation within this vast, cathedral-like containment vessel. In this picture, the shrapnel shields have been removed from over the pressure tank and the hatch has been removed and placed on the lily pad revealing the open reactor tank. Monitoring was performed and experimental equipment was often assembled in this area.